This series has such a special place in my heart now! I just LOVED We’ll Always Have Summer! I’ll admit, it’s slightly weird to see Belly in a place that’s not Cousin’s. Cousin’s really is a special place, and so much has happened there. But I also liked seeing Belly at college and how she’s really growing up, and how she’s not the same girl as she was when she was 16. She had such a hard decision to make in We’ll Always Have Summer, but I think anyone who has read the series will be able to figure out who she chooses in the end. Which is also interesting, because I’ve gone back and forth on who I wanted Belly to be with. But as much as I liked her with Jeremiah at one point, this book really showed that he and Belly aren’t meant to be, no matter how much he cares about her. There were things he did that made it feel like he was more in love with the idea of being with Belly than he actually loved her. I’m sure he did love her, but he just seemed like a completely different Jeremiah in this book. I just love the relationships we see in this book- the one between Belly and her brother, the one between Belly and her mom, Belly and Conrad…and there is even that part of me that liked Jeremiah and Belly, because I think it took being with Jeremiah and spending time at Cousin’s with Conrad for both Belly and Jeremiah to realize that it wasn’t going to work out. We’ll Always Have Summer made me want Susannah back SO MUCH! I couldn’t help but wonder what Susannah would think, and how different things would be if Susannah were still alive. I love that she left a letter for Belly to read on her wedding day! Speaking of Susannah…it really does seem like everyone’s made peace with her death. I also like that we see happened two years after the events of the book, and that we get the resolution we’ve really been waiting for- assuming you wanted things to go that way, of course. And I’m glad my copy of We’ll Always Have Summer included Conrad’s letters to Belly- I loved reading them! 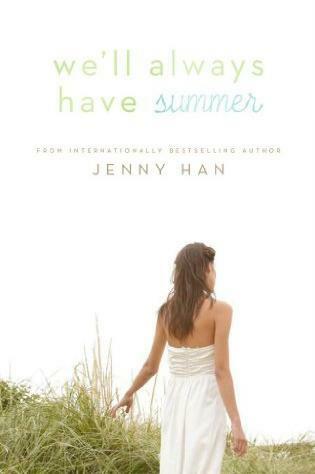 I loved We’ll Always Have Summer, and this series makes me feel so nostalgic and wistful. I’m glad things worked out the way they did, and Cousin’s is such a special place. We’ll Always Have Summer gets 5 stars.